My girlfriend, Laura, grew up in Central Pennsylvania, and she has PA Dutch roots going back to the 1600’s. Her favorite pie is Shoofly pie which is a traditional PA Dutch recipe featuring molasses. I had never had shoofly pie before, but wanted to try making a vegan shoofly pie like the ones she had growing up. 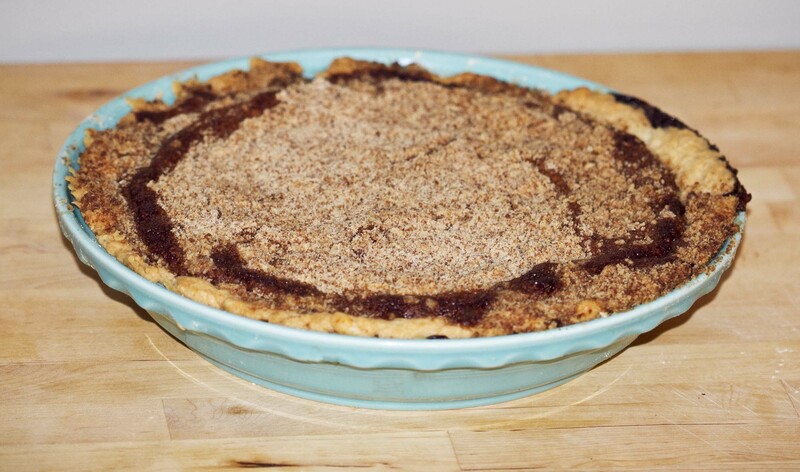 There are different variations on the shoofly pie including wet bottom and dry bottom. Laura said this pie is very similar to the ones she grew up with and that it falls somewhere between a wet bottom and a dry bottom shoofly pie. 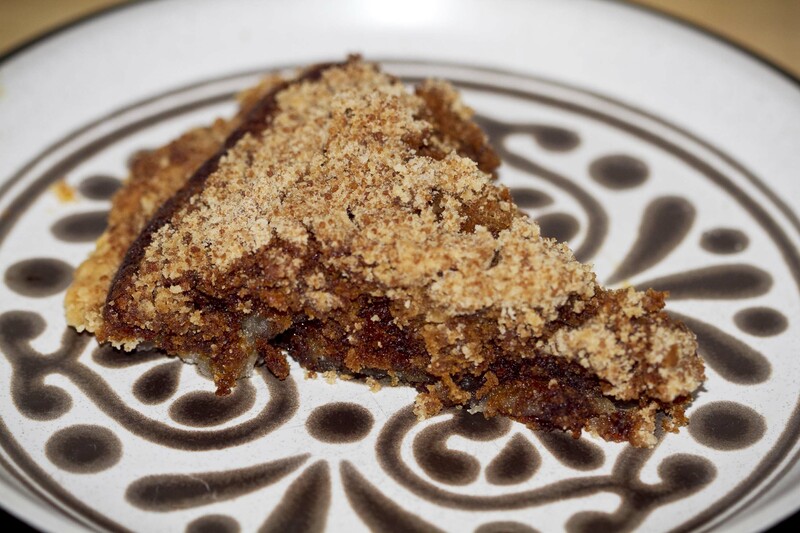 Having never had shoofly pie before, it tasted similar to gingerbread minus the ginger since the molasses bottom and crumb topping merge and create a cake-y layer in the middle. Although pies are usually best warm, I actually liked this pie better after it sat in the fridge for a day or two. The molasses firm up and I like the texture after the layers have settled a bit. This makes it a perfect recipe to make a day ahead of time for Thanksgiving or Christmas! The molasses give it a flavor that just seems to fit with the fall/winter months when gingerbread, gingersnaps and other recipes with molasses are popular. Before we get to the recipe, I also wanted to share a list of upcoming craft shows where I will be selling my handmade fused glass including pendants, earrings, bracelets, pins, and ornaments. My brother, Don Morrison, will also be at these shows with me selling his fused glass and metal jewelry and glass dishes. It would be great to see you at a show! If you don’t live in the area, check out the jewelry I have posted on my Etsy Shop – The Creative Kat. I have many more pendants, earrings, and bracelets than I can list on Etsy, so if there’s something in particular that you’re looking for or you want to see other colors or designs, let me know! And now, back to the Shoofly pie! Prepare the pie crust following this recipe. Place the dough in the refrigerator for an hour before assembling the pie. Roll out the pie crust on a floured surface to about 1/4 inch thick. Place it in the pie plate, remove the excess dough, and crimp the edges. Set aside. Break the vegan butter into small chunks. Prepare the crumb topping by combining the flour, brown sugar, and butter. You can use a stand mixer or mix it by hand using a pastry cutter. Mix it until it starts to stick together and look crumbly. Over-mixing will turn it into dough, so keep an eye on it. Whisk together the Ener-G Egg Replacer powder and warm water and set aside. Bring the water and baking soda to a boil. Remove from heat and whisk in the molasses and egg replacer mixture. Pour the molasses filling into the crust. Then sprinkle the crumb topping evenly over the filling. Most of the crumb will sink into the molasses filling, but some will stay dry on top. This is what creates the layers of molasses, cake-y middle, and crumb top. Bake the pie for 45-55 minutes. Let it cool and serve warm or cold based on your preference. Enjoy! This entry was posted in Recipes and tagged Central Pennsylvania, Christmas recipe, crumb topping, dessert, holiday recipe, molasses, PA Dutch, Pennsylvania Dutch, pie crust, shoe fly pie, shoo fly pie, shoofly pie, Thanksgiving recipe, vegan pie. Bookmark the permalink. ← Craft Show Photos and Nectarine Citrus Bean Salad Recipe!